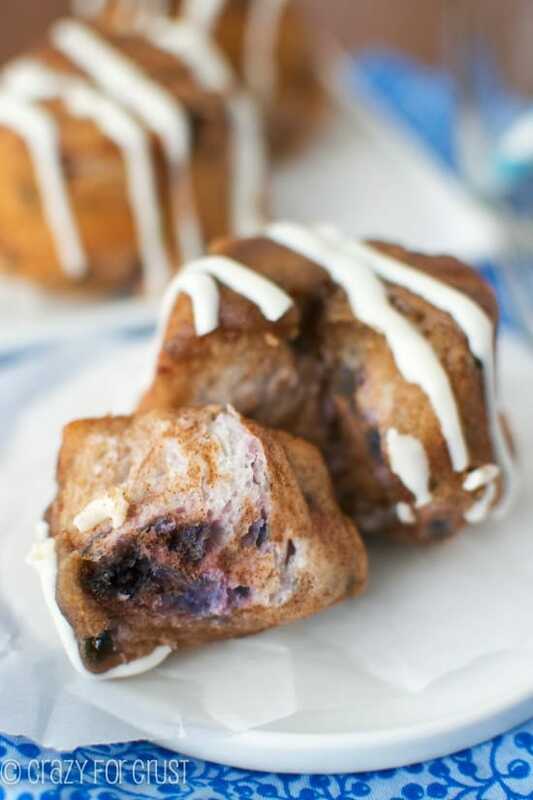 If there is one indulgent breakfast I can’t get enough of, it’s monkey bread. Then I made chocolate monkey bread and all bets were off. I realized last week that I’m a horrible, horrible mother. I mean, I have my good points like making Jordan monkey bread on a whim, but overall, her therapy bill is going to be outrageous. Her allergies have been really bad lately and one night last weekend she woke me up at midnight because her cough was keeping her awake. She needed some cough medicine and Sudafed (two industries that I’m keeping afloat thanks to seasonal allergies). Needless to say, we were both pretty tired the next day. And the only thing she was worried about? I’m not a very nice person when I don’t sleep. Hence, horrible, horrible mothering. That’s monkey bread. That’s coated in ooey, gooey chocolate. You’re welcome. 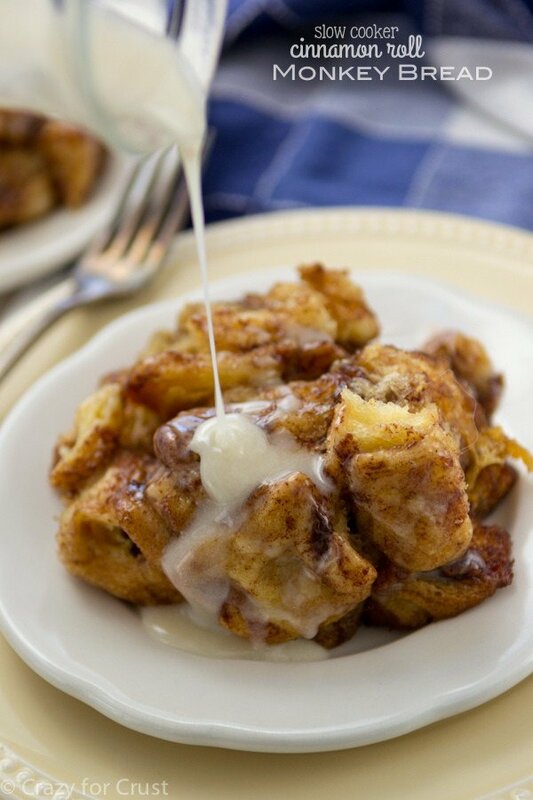 In my quest to make some good brunch recipes you could use for Easter or Mother’s Day, I thought about Monkey Bread. 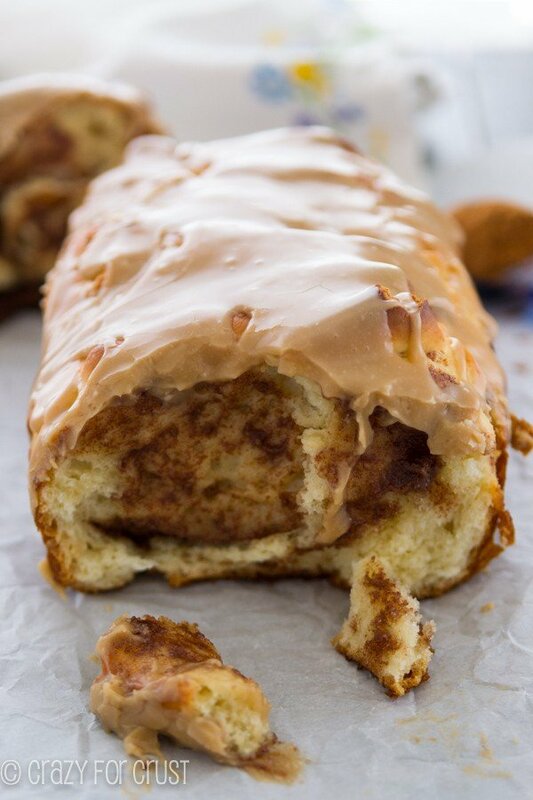 After all, monkey bread is a major staple in our house. It happens every Christmas. Usually I just use the regular Pillsbury recipe. Sometimes I add peanut butter. Or sometimes I add butterscotch pudding. This recipe couldn’t be easier. You start with Grands! biscuits. Cut them into pieces and coat them in a sugar and cocoa mixture (instead of cinnamon, but you could totally add some if you want). The biscuits are layered in a pan with chocolate chips and a butter/brown sugar/cocoa mixture. Once it’s baked, you turn it onto a serving plate and top it with chocolate sauce. More chocolate > Less chocolate. Note: I wrote this in the recipe, but it’s very important. Make sure you turn out your entire monkey bread onto a serving plate within 10 minutes of it coming out of the oven. Don’t serve it in the pan, unless you want to just throw away your pan and start over. Once monkey bread cools it turns into a stone not unlike granite. This is perfect for a celebratory brunch, like Easter. It’s also kind of a dessert because, hello brown sugar + chocolate. And it’s an easy enough recipe that your kids can make it for you for Mother’s Day. Then you can stay in bed as long as you want. And that doesn’t make you a horrible parent…right? An easy breakfast, brunch, or dessert recipe that's full of chocolate! 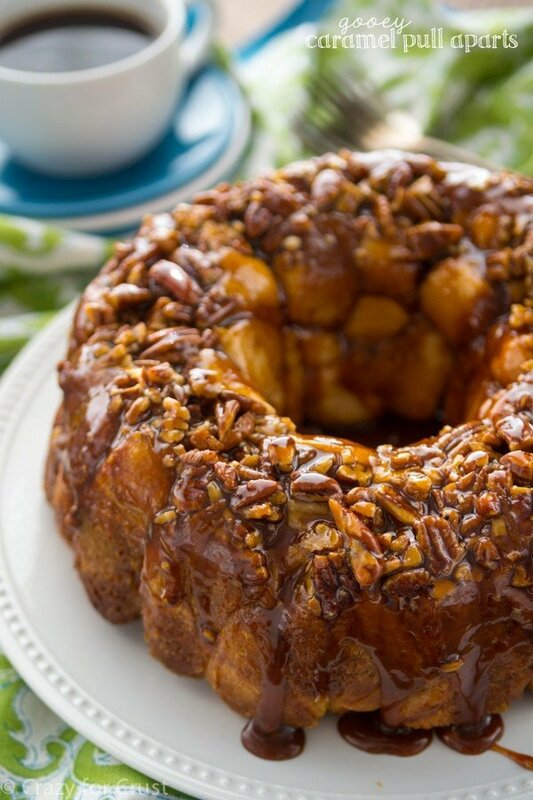 This Monkey Bread starts with a premade biscuit and comes together in just minutes. Perfect for any holiday! Preheat oven to 350°F. Spray a 12-cup fluted bundt pan with nonstick cooking spray (I like using the kind with flour in it). Open the cans of biscuits and slice each biscuit into 6 pieces. Place the granulated sugar and 1 tablespoon of cocoa powder in a large gallon size ziploc bag. Add the biscuit pieces, seal the bag, and shake to coat. Mix melted butter, brown sugar, salt (if using) and remaining 2 tablespoons of cocoa in a small bowl. Place half the coated biscuit pieces in the prepared pan. Top with half the chocolate chips and half the butter mixture. Repeat a second layer of biscuits, chocolate chips, and butter mixture. Bake for about 30-40 minutes until the top is very brown and the center isn’t too jiggly. The top will get crusty so you’ll want to take it out when it’s still a little jiggly in the center so the top doesn’t burn. Let cool in the pan for about 5 minutes. Place a serving plate over the pan and invert the pan, tap the top a few times and pray that the whole thing comes out in one piece. If it doesn’t, just stick the pieces back together, no one will know! Note: do not let this cool completely in the pan or it becomes like a rock and it will be very hard to clean your pan! Serve as an indulgent breakfast or dessert. For extra chocolate flavor, top with chocolate sauce. Did I comment on this twice? probably because I CAN”T GET OVER IT! Guuurll! YES! Love this Dorothy! Woah, baby!!! 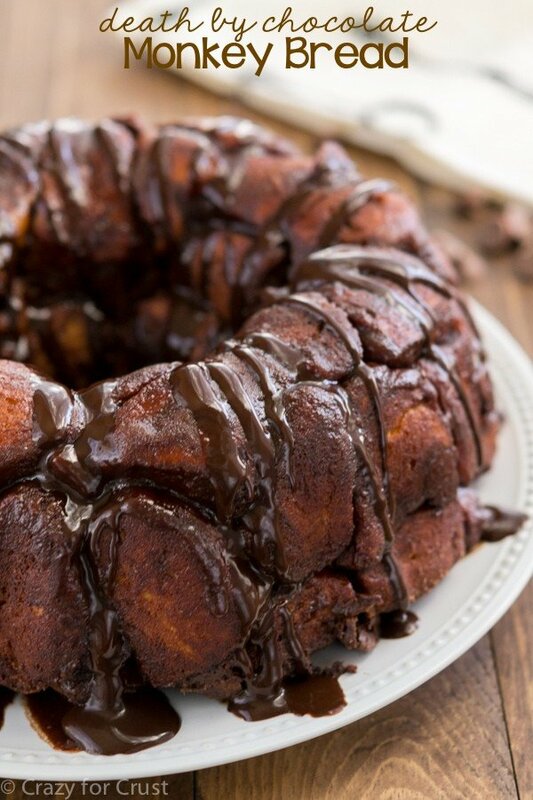 Chocolate monkey bread come to mama!!! That is all sorts of awesomeness!! And no way are you a bad parent…you are amazing! Don’t forget it. I know what you mean about the mean without sleep though. I am kind of a bear if my kids wake me up in the middle of the night. awww it’s so sweet that she is so apologetic, though! I think you’re a great mom! 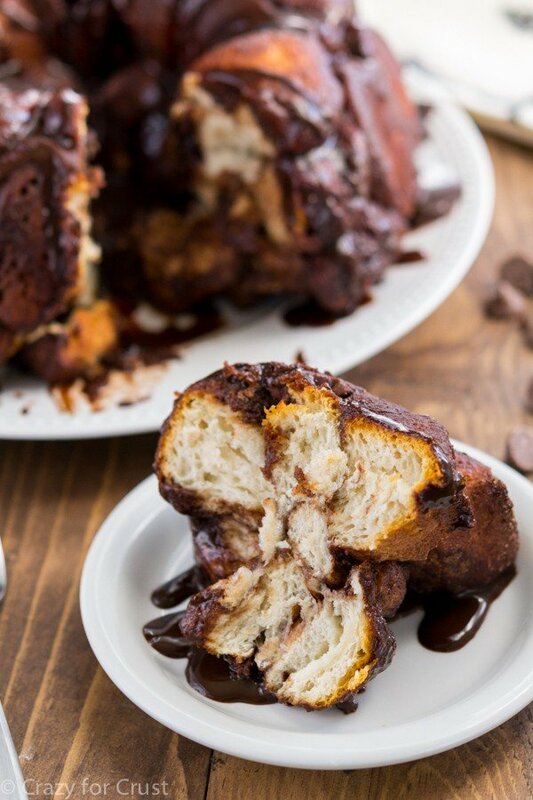 and I mean…this chocolate monkey bread….does NOT hurt. I pretty much gasped when I saw it. Made chocolate monkey bread. Have yet to taste, however it would be a good idea to place a pan underneath bunt pan as chocolate went all over bottom of my oven and made a huge mess! Oh no!! I’m so sorry! I hate when that happens, and it always happens when you least expect it. Is your pan a 12-cup bundt? Mine reaches right to the top but doesn’t go over. All pans are probably created differently! Great tip too, I’ll be sure to add it to the recipe! I’m definitely making this for a brunch on Saturday. I’m debating covering it with “nothing bundt cakes” cream cheese frosting instead of melted chocolate. But now I’m afraid my bundt cake pan isn’t big enough – honestly I have no idea how many cups it is! I’ll post back with the results! Enjoy!! You can put the budnt pan on top of a cookie sheet to make sure no spilling happens!